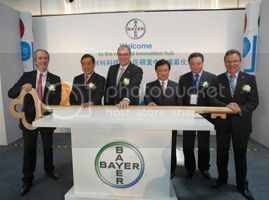 Bayer MaterialScience (BMS) has inaugurated a regional innovation hub for Asia Pacific in Shanghai, China. More than 200 experts will develop novel ideas for the use of high-performance plastics, foams and coatings in key sectors such as mobility, construction, IT and renewable energy. They will work in close cooperation with external scientists, suppliers and customers. The new hub, which is located at the company’s existing Polymer Research & Development Center (PRDC), will provide support to other innovation facilities across the region. "Our regional innovation hub will become a significant contributor to our overall global innovation network," said Patrick Thomas, CEO of BMS. "It should become indispensable in terms of competencies, projects and products. We are aiming to reach a global innovation footprint for Bayer and its partners by exporting China-made technology to the rest of the world by 2020." The new centre is expected to attract local talent and enhance knowledge-building and transfer. Employees will work in global cross-boundary teams, including colleagues at R&D centers in Europe and North America. The innovation hub will be supported by a network of production sites in Asia Pacific, the biggest ones being in Shanghai, Map Ta Phut (Thailand) and Niihama (Japan). Asia Pacific is among the strongest growth regions for BMS and accounted for more than one quarter of total sales in 2012. This growth is mainly driven by a rising number of infrastructure projects and increasing demand for cars, electronic consumer goods and new housing from an emerging middle class. Urbanisation further drives the construction and mobility sectors. At the same time, the growing demand for energy prompts governments to look at sustainable sources such as wind and solar energy.